CCS is essential for the incorporation of copper into SOD-1, and therefore is necessary for its enzymatic activity. CCS prevents copper ions from binding to intracellular copper scavengers and provides the SOD-1 enzyme with the necessary copper cofactor. 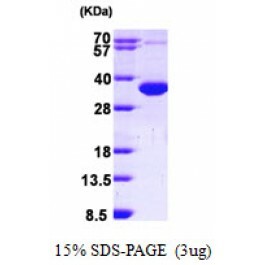 CCS escorts copper only to SOD-1 and fails to deliver copper to proteins in the mitochondria, nucleus or secretory pathway. While many tissues express CCS, the chaperone is most abundant in the kidney, liver and Purkinje cells in the neuropil of the central nervous system. Romerius P., et al. (2010) Clin Cancer Res. 16(15):3843-50. Seetharaman SV., et al. (2010) Biochemistry. 49(27):5714-25. 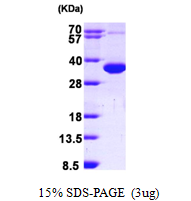 Recombinant human CCS protein, fused to His-tag at N-terminus, was expressed in E.coli and purified by using conventional chromatography techniques.